Hi Dedoosers, today we are going to talk about importing and analyzing your focus group transcripts in Dedoose. How do I code my focus group transcripts? The first method we touched on, coding the document as any other would be used when you only have information at the focus group level and would not want to analyze on the group level. The second method, which we didn’t touch on at all, would be for focus group transcripts where analysis would be done on the individual level. This will ensure your code application counts are unique to the individual and will let you link Mike’s document to Mike’s descriptor. Why can’t focus group transcripts be linked to multiple descriptors? Now, before we move to linking your documents to descriptors, we should touch on why these steps need to be done separately. In general, Dedoose can only link a single descriptor to a media file per descriptor set. This is due to the system taking all coding in a media file as a unified set of excerpts, not separating them by participant or any other attributes. If Dedoose were to allow multiple descriptors from the same set be linked to a document, then these excerpts would just be double-counted. NO GOOD! How do I link my descriptors to my transcripts? Once we have our files imported and arranged it’s time to link them to the appropriate descriptors. This is essentially the same as linking descriptors in any other scenario and you can do so from several places. Assuming you already have descriptors created for each participant we can do this from the ‘Descriptors’ tab by following the instructions below. But what if I haven’t created my descriptors yet? Not to worry! As long as you’ve at least established the Set Fields for your descriptors we can also do this from the ‘Media’ tab. Simply follow the next set of instructions here. While this is the same process to link descriptors in any project, when working with focus groups and cloned documents making sure your titles reflect the individual participant can save a lot of headaches in trying to attach the right file with the right descriptor. What if I want to analyze on both the individual level and the focus group level? This sounds like a job for ‘Descriptor Sets’! Anytime we are working with quantitative data from several distinct levels we separate that data into different Sets. You can think of them as folders for the Set Fields, in this case we’ll want a Set for individuals and a set for the focus group itself. While in the previous section we discussed how to attach descriptors to media for participants, this will be slightly different. For our focus groups the data will not be bound to an individual, but be common factors of the group itself. Perhaps the groups had IDs, were done in different regions, or at different times of year. In this focus group set we can place all that data. Once we’ve established the fields of this new descriptor set we can go about creating the descriptors and linking them to our media the same as we did earlier with the individual set. Once we’ve completed this process we have everything we need to analyze our data at both the individual level and the focus group level. That about does it for our blog on focus group data. If you have any questions, comments or suggestions we would absolutely love to hear them! Always feel free to let us know what you’re thinking by shooting an email to [email protected]. Bruce the Dedoose Moose is on the move! 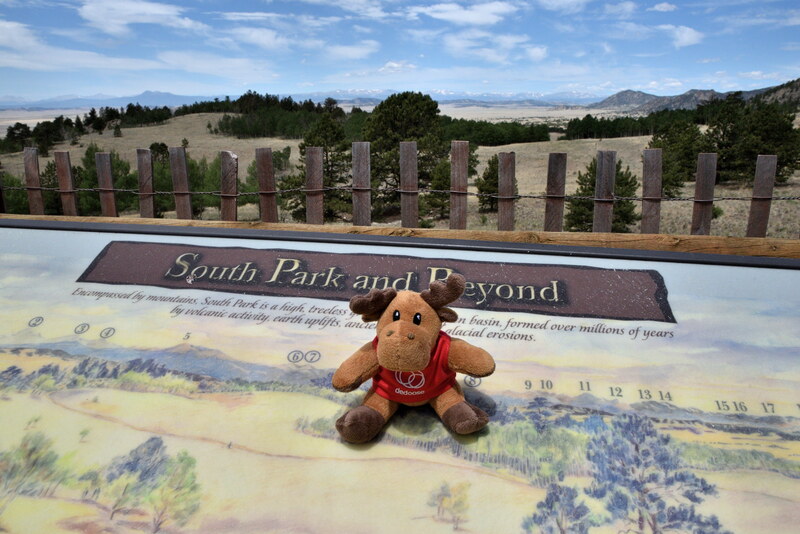 Recently sighted in South Park, CO a brave and weary traveler managed to get this quick shot of the moose in the wild. Let us know if you have any Bruce photos you’d like to see show up in a blog, we love to share! Check out our blog, "Analyzing your Open-Ended Survey Data" to learn more about analyzing qualitative and quantitative data!